providing a copy of this photograph. and to John Stewart who runs a Leith web site that includes this photo. 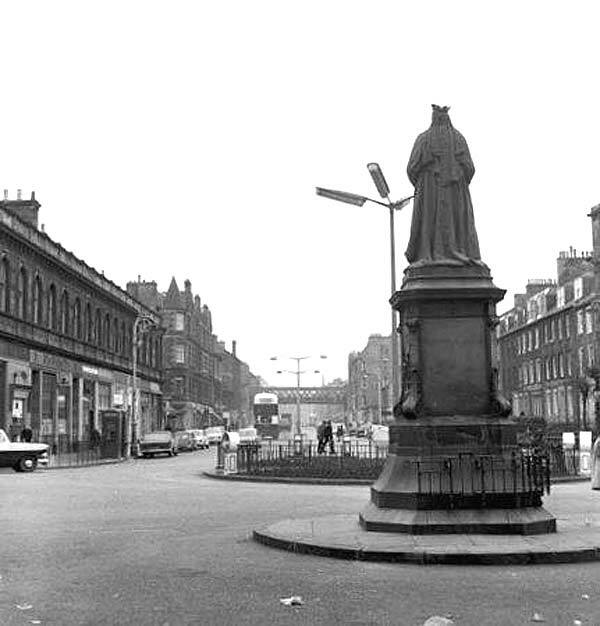 This photo has been taken from behind the statue to Queen Victoria at the foot of Leith Walk. It looks past the statue and up Leith Walk towards Edinburgh. The building on the left is Leith Central Station (now closed) which includes The Central Bar (still open). Looking further up Leith Walk, beyond the bus, the railway bridge at Manderston Street can be seen. The bridge has since been removed, leaving only its supports on either side of Leith Walk.